My Life with Pipidinko: Christmas Countdown Activities. Day 6. 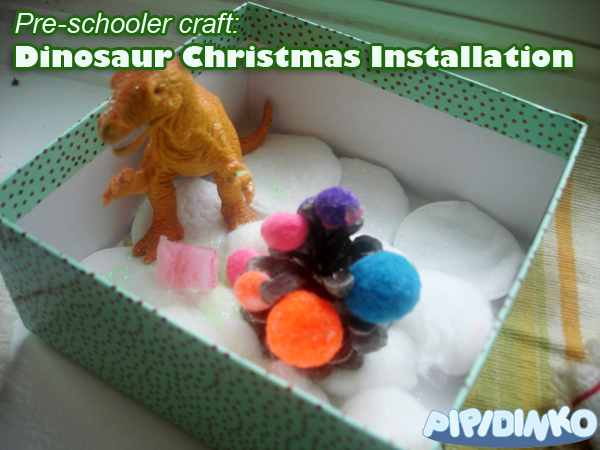 Dinosaur Christmas "Habitat". Christmas Countdown Activities. Day 6. Dinosaur Christmas "Habitat". Here is a fun installation we came up with today. Well, we first decorated a couple of cones with glitter and pompoms. I actually found some old hair gel with glitter. I let Santino squeeze it all over the cones, and he enjoyed it, squeezing away. After we decorated the cones, it kinda felt that this projects needs an extension. Some twist. Something extra. So I found a nice stiff box, and suggested we make a Christmas tree installation. Santino had no idea what I was talking about, of course, until I took out the glue again. I let him squeeze the glue (squeezing seems to be his favorite part of these activities) all over the bottom of the box. Then we put in some cotton balls and cotton pads, to make it look like a snow covered ground. We glued one of the snow cones in the corner to look like a Christmas tree.